It was stiff competition for this coveted title. Ashley Burch has come a long way since the Youtube series “Hey Ash, Watcha’ playin?” and she has been making a name for herself in video game voice acting. So, to clarify this isn’t Lego: Jurassic World. I have now played two different Lego games and they are sloppy, warm excrement. It isn’t Fallout 4 and it certainly isn’t Mortal Kombat X. The less said about Persona Dancing All Night and Evolve the better. Ignore everything that Dylan has written about it here; Remember Me is a bad game with some cool ideas in it. Life is Strange is the distillation of those cool ideas into a simpler and more effective game. It also has ideas; progressive ideas that most mainstream games don’t tend to deal with. The story revolves around a teenage girl called Max who discovers that she can reverse time. This ties in with rediscovering her childhood friend – Chloe, voiced by Burch – and having a premonition that a huge storm is going to destroy the town she is living in in seven days’ time. The first couple of episodes in this five instalment game are deliberate. Every choice that Max makes can be reversed using her power, allowing you to see the direct outcomes of your decision. It is fun to do this as it offers a mechanical explanation for why you might reload a save that fits into the world of Life is Strange. It also allows for you to see the outcome of your choices and how the game subtly plays out its scenarios in a satisfying manner. However, it is difficult to see what the game wants to be. Is it a teen drama, a sci-fi yarn, a crime mystery? All of these genres blend together and rather than settle on one mood the game skips between them with abandon. It takes a little while to get used to but once you do it starts to feel eclectic instead of jarring. The game is at its strongest when you are allowed to travel around an area and explore its environmental storytelling as well as talk to characters. At the very beginning of episode 1 Max walks around her campus and talks to multiple people about Rachel Amber, a missing girl. Each person has a slightly different tale and Life is Strange does well to not let you see an absolute truth, something that stays with you until the conclusion of Rachel’s storyline where you remain unsure of her actions and motivations. Later you get to walk through school dorms, reading peoples’ diaries, rooting through their drawers and litter, with each bit found telling a story and poking at issues like depression and the weight of clique conformity that is enforced in school. What feels great about this (other than the fact that Max under the player’s control is maybe a little too nosy) is that it isn’t as heavy-handed as the game’s source material – 90s teen dramas. Life is Strange has many shades of grey to each story and just because one character is a bully doesn’t mean that they got there by being moulded from birth for that role. The third episode is probably the best of the series. In this you begin to realise that the short-term results of your early choices have wider spreading effects. Things that you have read or discovered previously feed into that; there are even moments that you can rewind that will colour your perception of what is going on that have no meaningful game impact. 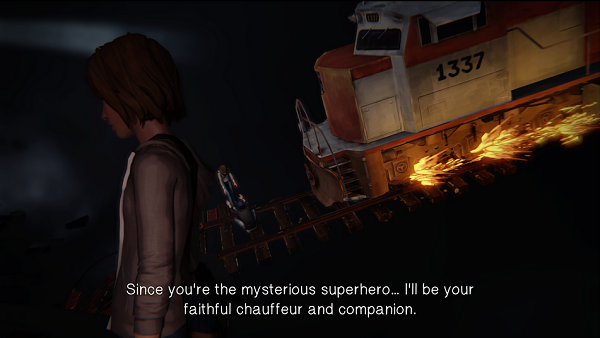 At the centre of this is Max and Chloe’s relationship, their interactions by turns clumsy, uncertain, joyous and warm. Many of the game’s detractors found the slang and some character motivations erratic. For me they sounded like teenagers who really didn’t have a clue what they are doing and what powers they were playing with. The fact that they don’t know how to harness Max’s powers and use them for far greater things feels like the sort of thing self-obsessed teens would do. Most of the dialogue felt authentic, or at least as authentic as dialogue conceived by middle-aged French developers could produce. That said I do object to having a teen girl in 2015 say that she thought Final Fantasy: The Spirits Within was a good film, no one thinks that. It is a shame that episodes 4 and 5 stumble a great deal. Episode 4 sets up the finale well enough but it tries to spin one too many twists into an already convoluted story (this is where the game not being able to decide what genre or mood it wants to be became a crutch, as it then had to abandon several plot lines). More disappointing is that, even with the contortions the plot attempts, it still ends with some pretty predictable conclusions. Episode 5 then spends most of its time trying to undo all of the choices you have made up until that point. It is at about halfway into the episode that it pretty much starts to invalidate most of the thrust of the previous entries and goes its own route. 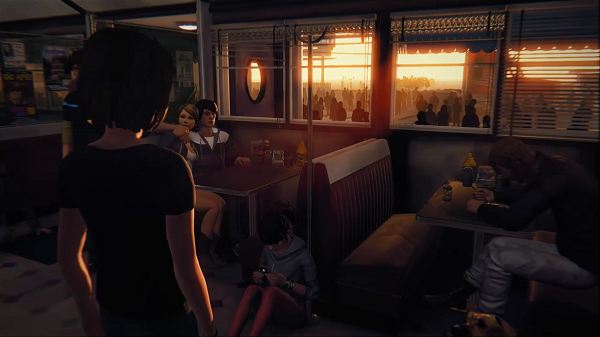 I can sort of justify that by the ending which gives Max widely different choices to make, tough ones at that, but in some ways it made me wish that either Life is Strange had aimed to not tell such a grandiose story, or had benefited from a bigger budget and it didn’t have to resolve itself so cleanly. Nevertheless, Life is Strange is worth playing, not least for having two women at the centre of the story and featuring a number of complicated issues that the game attempts to address (admittedly it gets it wrong in a number of ways but that is for another article). I would like to think this is the direction that more mainstream games will take as we move into 2016 and beyond, and that more people will be okay playing a game where you rewind time just to warn a girl that she is about to get hit in the head by a football. Also, that music: every time I booted up the game it had an instantly mellowing effect. I recommend you go check it out. Worth the price of admission alone. Well, I think we can agree on this game. I have very little to add to this write-up. It’s a fantastic game, even if it could have benefited from either committing to one thing and telling a simpler story, or a longer runtime. I wrote down some thoughts on the game and the ending in comments to one of Shaun’s diary entries. Firstly, you and your ilk are a bigger problem with Evolve than Evolve is. And the publishers are even more of a problem than you are. The only thing which isn’t really at any fault is the game itself. Secondly, Remember Me isn’t a bad game. In ten years time, you’ll look back on it fondly as the last gasp of a noble but sadly deceased genre. Agree on the first point, me not liking the game and being utterly confused by the publisher’s monetisation of it is totally the game’s main problem. Second point – nope. Remember Me is terrible. I’ve tried going back to that game 4 times now and each time I hate it a little more. Oh – one thing I forgot to mention, we both have a strong disdain for all Lego Does X Franchise games. In the grand scheme of things, two people in the world who share an opinion isn’t a notable statistic but when it’s you and me, that’s, like, the stars spelling out the lottery numbers. Predictably, I’m over here in another camp. I liked LEGO Jurassic World! Still not played Remember Me as 2 out of 3 Arcadians have given it the stinkfist. …just re-read the first paragraph. Huh, I had no idea Burch did voices in LJW. MAYBE I’LL PLAY IT AGAIN TO SPOT HER no that’s not going to happen.